Notes: The Raseborg Castle (Finnish: Raaseporin linna, Swedish: Raseborgs slott), is a medieval castle in Raseborg, Finland. The castle was founded by Bo Jonsson Grip and it is thought that the castle's first phase was completed sometime between 1373 and 1378. The first written data about the castle is from 1378. Its main purpose was to protect Sweden's interests in southern Finland against the Hanseatic city of Tallinn. The castle was originally built on a small island in the north end of a sea bay. The historians think that the castle was built in 3 different stages over time from the 14th to the 16th century. The ruins of the outer wall of the castle do still exist. According to the historians the outer wall was built to protect the foundations of the castle itself. When the use of the artillery got more common, it was vital to protect the basic walls of the castle. There was also one more protection outside the castle. That was a wooden barrier, which surrounded the castle and it prevented any foreign ships to approach the castle harbour. There still exists some small parts of that barrier. The barriers are today on the mainland, but in the 15th century they were located on a peninsula by the sea. The sea level became lower over time due to postglacial rebound, and it became increasingly difficult to approach the castle by boat. This is one of the main reasons why the castle lost its importance. Battles were fought between Swedish and Danish forces and even pirates over control of the castle in the Middle Ages. 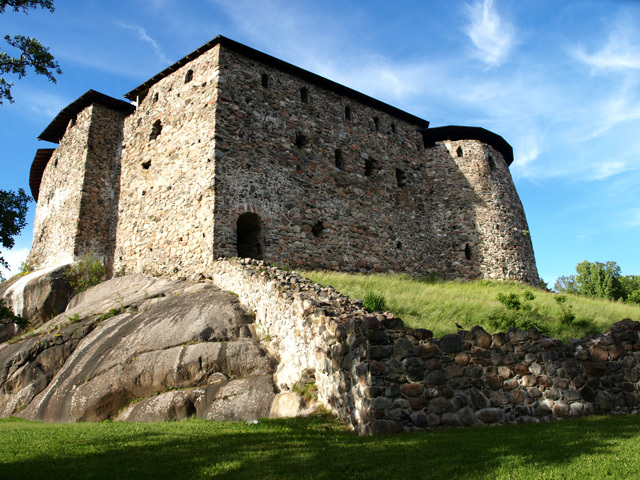 The castle was abandoned in 1553, three years after Helsinki was founded in 1550 and Helsinki became strategically more important. Restoration work began in the 1890s and in these days the castle ruins are open to the public. Close to the castle ruins is one of the largest open-air theatre stages in Finland, the Raseborg Summer Theatre. The theatre was founded in 1966, and gives numerous performances in Swedish every year in July, often with a connection to the castle history.